Buying local produce is becoming more and more popular, but the fact remains that many cities are so dense that the closest available farmland is still many miles away. 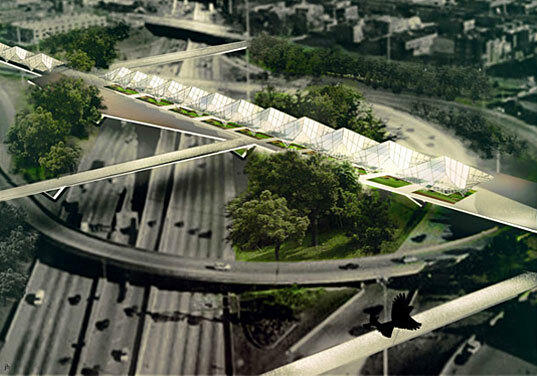 Studio Gang hopes to change that situation in Chicago by transforming the Ohio highway feeder ramp and transforming it into a ramp that feeds. 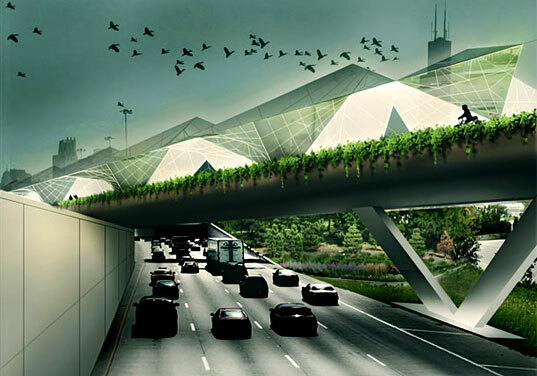 Called FEEDER, the project would populate the underutilized open highway space with urban greenhouses and gardens where the public can grow their own produce and green space for even those with browner thumbs to enjoy. The lack of farmland in Chicago means that food must be transported further and further to reach the population. And while it takes 12.5 acres of land to feed one person for a year with traditional farming, hothouse production feeds 36 times more people on the same amount of land. Feeder’s pyramid like greenhouses could be optimized to produce enough food to supply nearby markets and restaurants and buyers would only need to travel a short distance to pick up their fruits and vegetables – perhaps even on foot. Of the project, Studio Gang says “It magnifies and exposes the important aspect of food production as a necessity for urban living” and “it offers a useful and productive gateway architecture that reinvigorates Chicago as an urban habitat.” In addition to filtering the polluted highway air, the farms will educate the public and students, giving them a new understanding and a stronger connection to the production of food. Hi! I want to sing a song and dance a dance! I am a clown! Hi! Lets have a big clown party! I love the idea, but is there any danger of vehicle exhaust fumes affecting the plants? The lack of farmland in Chicago means that food must be transported further and further to reach the population. And while it takes 12.5 acres of land to feed one person for a year with traditional farming, hothouse production feeds 36 times more people on the same amount of land. Feeder's pyramid like greenhouses could be optimized to produce enough food to supply nearby markets and restaurants and buyers would only need to travel a short distance to pick up their fruits and vegetables - perhaps even on foot. Of the project, Studio Gang says "It magnifies and exposes the important aspect of food production as a necessity for urban living" and "it offers a useful and productive gateway architecture that reinvigorates Chicago as an urban habitat." In addition to filtering the polluted highway air, the farms will educate the public and students, giving them a new understanding and a stronger connection to the production of food. An elevation view of one of the hothouses.